I woke up this morning thinking of personal responsibility vs. institutional culpability and what it means to act with a depraved heart. The first two thoughts were because a friend of mine and I had argued the finer points of the murder of Michael Brown by police officer Darren Wilson. She (my friend) insisted that the findings of the Department of Justice exonerated Darren Wilson, saying his claim that he felt threatened was valid. I said that, regardless of the report from the DOJ, Wilson’s claims that he felt threatened were based on the color of Brown’s skin, not any overt action on his part. Brown allegedly stole some cigarillos from a local store and that was the reason for Wilson’s interest in him. If true, then yes, Brown needed to take personal responsibility for that petty theft; that theft did not warrant his death (an unwarranted plight, my friend also agreed.) Frankly I can’t imagine any young black man acting so menacingly toward a white police officer as Wilson alleged (and whose claim the DOJ upheld.) It makes no sense for a black man in today’s climate to act in a manner that is sure to bring down the hammer of retribution swift and strong, despite the fact that white people can act in threatening manners—and even actually be waving real guns around unlike 12 year old Tamir Rice and yet still, somehow the police managed to subdue them just fine without finding it necessary to kill them. 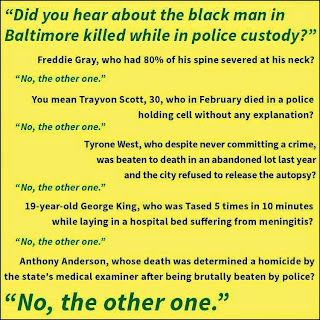 So even if I can accept that the DOJ was equally diligent in getting to the facts as best they could in both of these two investigations, Wilson’s claim to have felt threatened cannot be sussed out from the climate of racist perceptions that were daily reinforced by the police department; indeed this shows a relentless and vicious cycle of cops stopping blacks more frequently and denying them their constitutional rights based on their racist beliefs that blacks were more criminally inclined, even when their own records prove otherwise. In other words, even if Darren Wilson says he felt threatened, it doesn’t matter to me, because I don’t trust him and I don’t trust the system that trained him. If he felt threatened, it was because he was raised in a culture and took a job in a police department that gave him the erroneous message that he should feel threatened by a black man.There must be at least an equal amount of institutional accountability in such egregious acts. If Brown's personal responsibility for lifting some cigarillos ended in his death, there must be institutional accountability in the way the system fatally failed this young man that August day. And this brings me to my early morning musings of what does an indictment of depraved heart murder mean? This was one of the charges levied against six police officers in the recent death of 25 year old Freddie Gray who suffered essentially a severed spine while in police custody in Baltimore, MD. In this case, it was unclear why Gray was arrested; first reports of an illegal knife were unfounded; he did have a knife that was legal to carry. Still he was thrown in the “paddy wagon” in hand cuffs and shackled without being secured to the bench with a seat-belt- a safety measure that is mandated by the Baltimore police. 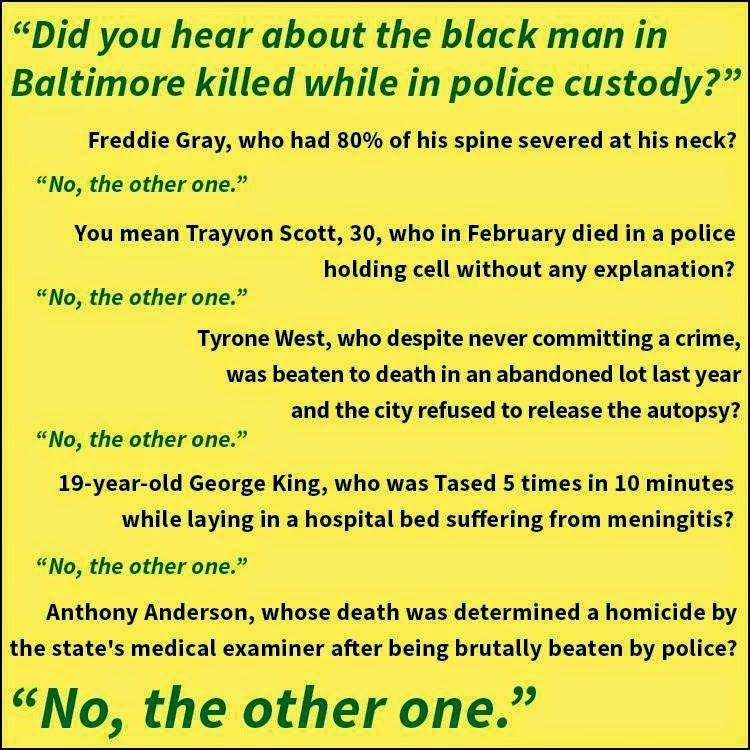 In the midst of hundreds of people protesting -- in Baltimore and across the nation-- the State’s Attorney for Baltimore, Marilyn Mosby, brought charges of murder and manslaughter against six Baltimore police officers--- three black and three white. The most damaging charge was brought against the driver of the van, officer Ceasar Goodson, Jr,; he was charged with Depraved Heart Murder. (3) that the defendant, conscious of such risk, acted with extreme disregard of the life-endangering consequences. According to a New York Times article, this grave charge takes into account the lack of care shown Gray while he was in custody. "'Following transport from Baker Street, Mr. Gray suffered a severe and critical neck injury as a result of being handcuffed, shackled by his feet and unrestrained inside the B.P.D. wagon,’ she [Mosby] said." It takes a person with a depraved heart to knowingly create a very high risk of life to another—regardless of whether or not that person has committed a crime. Baltimore, too, has made a name for itself as a place where black men interact with the police at their own peril. It takes a nation of people with depraved hearts to protest the protesters—calling them thugs and criminals and accusing them of destroying their own communities rather than daring to pull away the veil of blissful ignorance that keeps us from trying to understand such rage and anger. As a facebook friend of mine, Elizabeth Cuckrow Thorson put it, "Have you ever been so angry that you punched a wall? Smashed your favorite teapot? Taken a hammer to something just to hear it break? Now multiply that anger by 100 or 1000, because the cause of your anger is that much bigger, more pervasive and life-threatening. Then multiply that anger by the thousands of other people around you whose anger, like yours, has been ignored, dismissed, turned on you, for years and years. You might be burning buildings too." Of course, this public anger towards the protesters (not to mention the appalling conditions the arrested protesters faced at Baltimore Central Booking) also completely ignores the number of times white folks have gone on equally damaging rampages--- following the victory or loss of one of their favorite teams such as this story illustrates and yet no one ever has accused them of being thugs or acting out of the white criminal instinct. Instead, they’re described as fans letting off steam, who got out of control. In short, to be black in America is to have a highly-sensitive racism detector, not because one is irrational but because one’s life so often depends on it. It is to have little choice but to see the patterns in the incidents that white America would so prefer to see as isolated, no matter how often they occur. It is to have little choice but to consume the red pill (to borrow imagery from The Matrix), so as to see what’s going on behind the curtain of the larger society, even as their white compatriots have the luxury of walking around, firmly and indelibly attached to a blue pill IV drip, the reliance on which renders us equally unable to see what’s happening. And just because every now and then that red pill shows its consumers an image that isn’t quite accurate, doesn’t change the fact that in general it provides insights far deeper than those afforded the rest of us. Rather than bashing black people for seeing the connections and presuming them present, perhaps we would do well to remove the blue pill IV and substitute the red for a while. Maybe then we could begin to see what folks of color see. Perhaps then we could understand their rage. Most of all, perhaps then we could be a little less smug about the exoneration of an officer who, whatever his crime or lack thereof, still took a young man’s life. As a nation, the eyes of our whites are misleading us. Time for some new lenses. You know, I often get called names by people unwilling to surrender their own narrow interpretation of what racism looks like in America-- or unwilling to make room at the table for my opinion. One of the names flung at me in disdain has been that of "bleeding heart liberal." Though, as a Unitarian Universalist I don't think name-calling is a useful tool in discussing differences and serves only to give the name-caller the ability to dismiss everything I say, I will say this: I'd rather be known as someone with a bleeding heart than someone with a depraved heart. Indeed, it is time for all of us to get our eyes –and our hearts—examined, to free ourselves from this prison of separateness and widen our circles of compassion to embrace all. If we truly care about both individual responsibility and institutional culpability, we need first to get the facts right-- to know the whole truth, not just the parts we like. And, we need to be discerning about the role of each. The Justice Department did that in clearing Wilson of wrongdoing in the specific circumstances of Brown's murder while holding the Ferguson PD accountable for a larger climate of profound racism. You failed to do the same, instead demonstrating an apparent ignorance of the facts surrounding the shooting, and an appalling amount of arrogance in presuming to read Wilson's heart and mind. No matter what the DOJ says, you know "Wilson’s claims that he felt threatened were based on the color of Brown’s skin, not any overt action on his (Brown's) part." Further, you say, if he did feel threatened, it was only because he had been indoctrinated by a racist culture to fear black men. I'm going to go out on a limb here and say Wilson felt threatened because a 6-foot-5, 289-pound robbery suspect (who had recently shoved and behaved threateningly toward a much smaller store clerk) was fighting with him and trying to take his gun. I encourage your readers to read for themselves both DOJ reports, because you've left out a great deal of pertinent material that inconveniently undermines your opinion. The Lucifer Effect, by Philip Zimbargo, provides some insights as to how "depraved hearts" come into being. He is the social psychologist who devised and ran the Stanford Prison Experiment many years ago. He describes what happened, why, and how those lessons were confirmed in Abu Ghraib. Then he makes some suggestions for how to resist the social pressures that create jailers who are willing to torture and kill. He does point to the fact that most whites want to focus on what appears to clear Wilson while pointing to a much larger system of abuse. You miss the point. which can be understandable; it's a long article with lots of links. I suggest you do some research on the other side-- and maybe look at some of the other links in my post. Jo, thanks for this info. I remember reading about this, recently. Perhaps a good primer in the Police Academy.